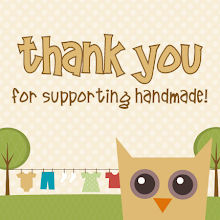 Owly Baby: City Jumper Pattern - Now available! I've finally finished up the new pattern - thanks to my wonderful testers! The pattern will be available for sale at 50% discount for the first 10 buyers (sale price is listed). Here it is! It has large pockets, lots of piping, a zipper closure and it's perfect for the upcoming holiday season! Layer it with tights and a long sleeved shirt! She's so happy to be modeling for the first time! Pockets for all your special treasures! How cute is that little one!? 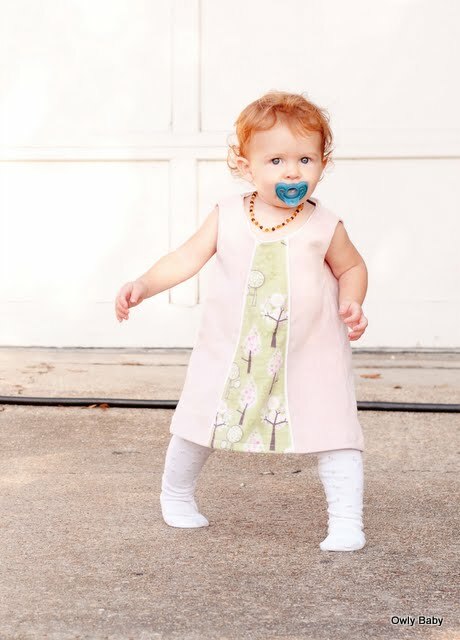 I just want to pinch her little cheeks and make her 5 more dresses! This jumper brings backs memories of back-to-school outfits, trips to the zoo and everywhere in between. The easy fit, a-line style allows for layering long sleeved shirts underneath or your favorite cardigan on top. With a partial lining, centered back zipper, optional pockets and plenty of piping, this little jumper is a cinch to sew. It looks great with plaids or showcasing your favorite print in the center panel. 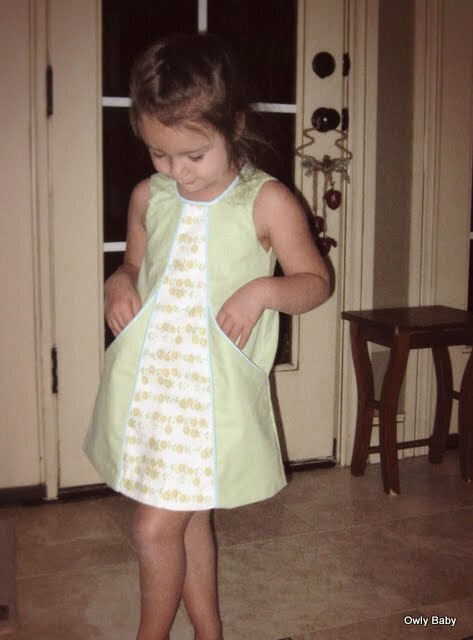 This is an intermediate level sewing pattern and tutorial. CLICK HERE TO BUY IT NOW, 50% off! Yep! I can't believe I sewed the entire dress AND photographed it before my HUSBAND noticed the birdies and pointed it out to me! ARG! i looked and looked and asked my hubby if he could find the flaw, he looked at me crazy and said... are the birds *supposed* to be upside down? LOL, don't feel to bad!